Photo Gallery courtesy Pete Dunlop. 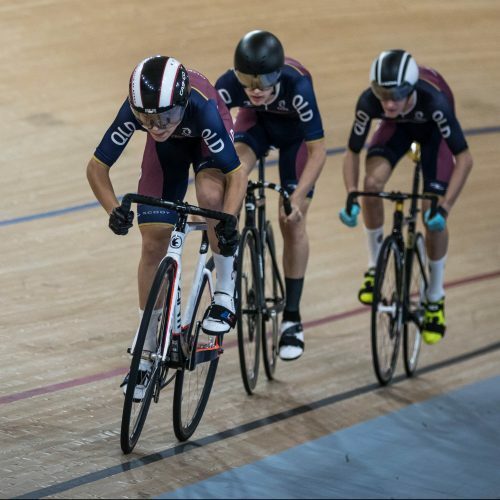 New South Wales has dominated the 2019 Cycling Australia Junior Track National Championships in Brisbane after taking home 17 of the 30 gold medals on offer across the four days of racing. Victoria claimed ten, Queensland two and Western Australia one. Under 17 Men’s – Daniel Barber (NSW) was named under 17 men’s Champion of Champions after claiming five gold (sprint, keirin, team sprint, time trial, scratch) and one silver medal, in addition to a national record (Flying 200m – 10.724). Under 17 Women’s – Alessia McCaig (VIC) claimed the Champion of Champions for under 17 women following her four gold and one bronze medal performance (sprint, keirin, team sprint, scratch) and national record (Flying 200m – 11.683sec). Under 15 Men’s – Benjamin Anderson (NSW) took the under 15 men’s award after winning five gold (points, scratch, keirin, time trial, sprint) and one bronze medal. Under 15 Women’s – Keira Will (NSW)‘s three gold (points, individual pursuit, scratch) in a five-medal haul saw her adjudged the under 15 women’s champion. On the final day of competition at the Anna Meares Velodrome, New South Wales claimed five of the ten available gold medals on offer. 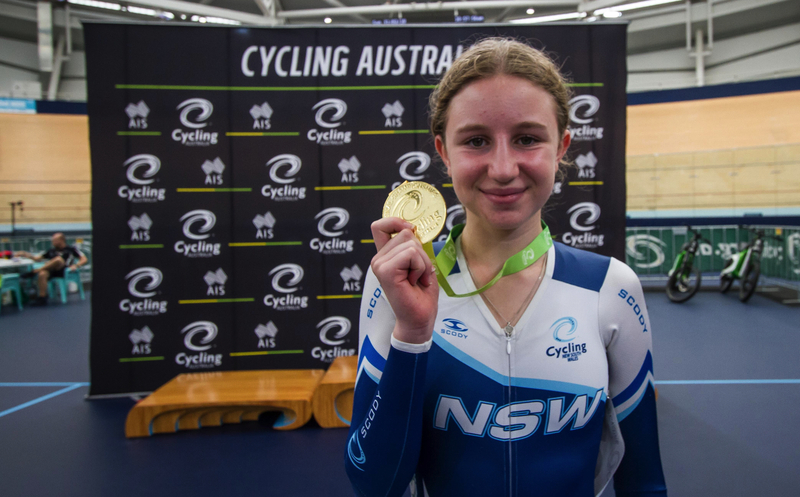 Keira Will (NSW) added an under 15 scratch race gold to her collection, whilst Indigo Skinner (VIC) and Sally Carter (WA) rounded out the podium. In the under 15 men’s scratch race, NSW’s Benjamin Anderson collected his third gold medal for the week with Oscar Chamberlain (ACT) and Luke Richert (QLD) joining him in the medals. Alessia McCaig (VIC) celebrated a quartet of under 17 women’s gold medals for the Championships with dual gold on the final day. McCaig’s versatility was on show as she took scratch race gold ahead of teammate Lucinda Stewart (VIC) and Isabelle Carnes (QLD), before winning the keirin over Claudia Marcks (ACT) and Meg Marker (NT), who secured Northern Territory their first medal for the Championships. In the under 17 men’s scratch race, Daniel Barber (NSW) took his fifth gold of the week ahead of Victorian teammates Tarun Cook (VIC) and Jackson Hadden (VIC). Sally Carter (WA) won Western Australia’s first gold medal for the Championships in the under 15 women’s keirin. Belinda Bailey (VIC) won silver, while Lauren Bates (ACT) made her first National level podium appearance. Benjamin Anderson (NSW) continued his gold medal haul in the under 15 men’s keirin, taking the top step of the podium over Oscar Chamberlain (ACT) and Luke Richert (QLD). New South Wales dominated the under 17 men’s keirin podium with Daniel Barber (NSW) taking gold and Mitchell Hines (NSW) winning bronze. Tarun Cook (VIC) who won silver. Victorian duo Alyssa Polites and Lucinda Stewart claimed gold in the under 17 Madison on 26 points. The NSW pairing of Haylee Fuller and Kalinda Robinson won silver (20 points) with Northern Territory grabbing another podium appearance with Alli Anderson and Meg Marker winning bronze (16 points). Earlier on in the under 17 men’s Madison, Victorian duo Alexander Jones and Max Leiner took gold (32 points), with Daniel Barber and Dylan Eather (NSW) and Mitchell Lohman/Tyler Tomkinson (QLD) completed the podium. #1 The 2019 Cycling Australia Junior Track National Championships is not always about the top step, and the national records set, sometimes it’s about personal bests, or achieving personal goals. This year was Lauren Bates’ (ACT) first Track National Championships. The last couple of days racing didn’t go Bates’ way, but she didn’t let this hinder her spirit. Her goal was still to walk away with top-five finishes in her races. On the last day of racing, Bates’ stepped on to the podium to receive her first ever Junior Track Nationals medal after winning bronze in the under 15 women’s keirin! Bates celebrated her bronze medal win with her family and friends in the crowd and coach/father on the infield. #2 Small but mighty! Northern Territory brought a three-member team to the 2019 Cycling Australia Junior Track National Championships. On the final day of racing, it was fantastic to see two of the three make appearances on the podium. Meg Marker (NT) won bronze in the under 17 keirin. Marker returned to the podium a second time with teammate Alli Anderson (NT) to collect their bronze medals from the Madison finishing only four points behind NSW. Photos – See Facebook gallery here.